A True Analog Delay Pedal from MXR! The MXR Carbon Copy analog delay features an entirely analog audio path, delivering rich, warm delay using old-school bucket brigade technology. The Carbon Copy boasts 600ms of delay time, with optional modulation via a top-mounted switch, and its simple three-knob layout gives you complete control over Delay, Mix (dry/wet blend), and Regeneration (delay repeats) - all in one incredibly compact pedal! For even more tonal options, you can also adjust width and rate control of the modulation via two internal trim pots. This pedal gives you everything from crisp bathroom slap echoes to epic delays, all with the simple twist of a knob. Stage-worthy blue LEDs and 9-volt operation round out this MXR Carbon Copy analog delay! 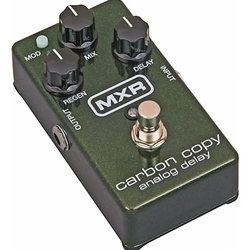 Expect rich, warm delay with the MXR Carbon Copy analog delay!